One Sunday afternoon at the start of the school holidays Daisy Malone was lying peacefully on her bed reading with her dog Ben when her father’s voice entered the room, turned left, paused for a moment to admire the view out the window and then continued across to Daisy. It’s easy to miss the funny in there if you’re not concentrating, but when you read it again, you’ll get a flavour of the sort of narrator James O’Loghlin is. He’s a little odd. So is the story, but in a good and funny way. When I saw that the same author had written Sir Roderick the not-very brave, I was cautiously keen to read this book. Cautious, because Sir Roderick, despite it’s not very promising title, became a very engrossing book, and I didn’t know if I had the time to get that engrossed. Keen, because Sir Roderick is actually a very good story with clever twists and turns. 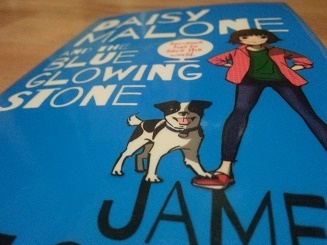 Turns out, while I didn’t find it quite as engrossing as it’s predecessor, Daisy Malone and the Blue Glowing Stone is definitely worth the read. It is internally consistent, by which I mean that while it’s clearly fantasy, it doesn’t betray itself within it’s own storyline. A lot of kids stories are either too shallow to run that risk, or too willing to be outrageous for outrageous’ sake. This one strikes a great balance and draws you in with a light touch. My daughter has spent all day reading it. This is one thing that I have a gripe about. It seems that in stories, and particularly children’s stories, girls must be portrayed as strong, resourceful, clever and independent (and in this story, rebellious and deceptive toward her father). In O’Loghlin’s previous book, Sir Rodney, the main character (a boy) was introduced as clumsy and foolishly out of his league. Here, while Daisy makes mistakes, she is never presented as anything other than capable and in control. There is one other girl, Eliza, a minor character whom we see so briefly that no character development is possible. The boys, on the other hand, are either stupid and mean, or stupid and kind. While one boy is present while things get exciting, Daisy is presented as independent of him, relying, when she must, on her dog and two aliens. (She relied on the boy once, and he failed). Adults are either dolts, or absent, or alien. Not surprisingly, the good men are dolts, cowards, and incapable (though Daisy’s father, the weakest of the lot, does develop). It’s one of the aliens who hold’s up the side for the males. The main woman (Daisy’s mother) is strong, courageous and dependable. It’s fairly typical and rather annoying. The other fairly typical protrayal is that the two strong adults (plus the others who weren’t real threats anyway) are taken out and must be saved by the child Daisy and her sidekick dog. Well, the sidekick dog isn’t necessarily typical, but the child hero is. I guess that’s children’s books for you these days. Writers seem to think children want to be the heroes and save the parents and adults. And I think some stories like that are fine. I just think there is a massive emphasis on children being the only sensible and clever ones in the world of children’s literature which I think is very concerning. I’d love to see more weight given to security and dependability of adults – especially men. At 314 pages, it was a good sized, fun book with a storyline that was intriguing while not being too heavy. It definitely had a light touch which made the read all the more enjoyable, though I wish there was less of a bias against the character of adults and males. I don’t consider that weakness a reason not to allow my children to read it, but it does make me aware of the need to provide positive real life role models for them so they can tell the difference between fictional stories where the world revolves around children, and the real world, where the world does not revolve around them.